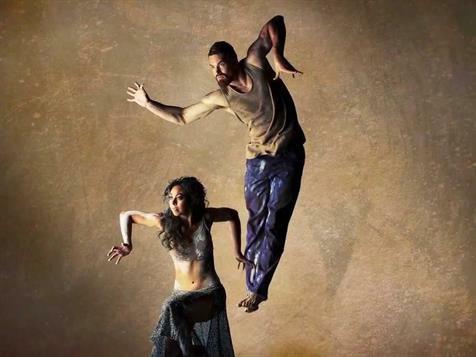 In Bangarra Dance Theatre’s latest work, Patyegarang, choreographer and Artistic Director Stephen Page honours the Eora people of the Sydney area, and commemorates their experience of early contact with European settlers. Bangarra’s headquarters is on Eora land. Patyegarang explores the story of the relationship between a young Eora woman of that name, and Lieutenant William Dawes, an English officer who arrived in Australia in 1788. While the story and its context are presented in an impressionistic style in 14 short sections, the threads and themes are clear — a tribute to the significant contribution by dramaturg Alana Valentine, acknowledged by Stephen Page. We see the special status that Patyegarang has among her people, the Eora women’s daily tasks of fishing and food gathering, the people’s use of boats, and the preparation for the hunt. Patyegarang meets Dawes, who is trying to understand his unfamiliar surroundings, and she explains and names different elements, including constellations in the night sky. This is subtly done: Patyegarang focuses her attention and movement on the different elements and Dawes observes, follows and joins her. In other sections of the work, we see the despairing Eora people in drab European clothing, suffering from illness, and men being shot by European soldiers. In one scene, Dawes wipes white ochre dust off a young man, and Patyegarang cleans black body paint off a young woman — both revealing the same colour skin underneath in a message affirming a common humanity. The interactions between Patyegarang (Jasmin Sheppard) and Dawes (guest dancer Thomas Greenfield) are tender and full of goodwill, except at the end where they confront the fact that they belong to opposing worlds. They part with sadness, but the work finishes with an affirmation of the Eora people’s connection with the land, and a re-honouring of Patyegarang. Sheppard is a gentle Patyegarang, while also conveying the character’s power and courage as a “chosen messenger” of her people. 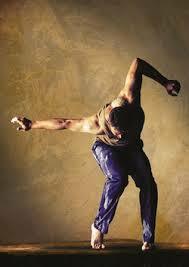 Her movements are rounded, and she skims her feet over the floor as she walks, as if feeling the earth. Greenfield, too, while a tall and commanding presence, has a gentle quality as well as great strength. Waangenga Blanco and Elma Kris as Eora leaders or elders added another dimension of spiritual power and authority to the cast. Blanco, leading the men in dance, was very strong and intense, in perfect command of the grounded traditional movement, with body upright, knees bent and legs swivelling. Kris’s trance-like entrance near the beginning and end of the work, bent over with a smoking wooden coolamon on her back, brings spiritual support and guidance. She leads the women as they gather around Patyegarang, carrying leafy branches and coolamons issuing resin-scented smoke. Smoke, ochre, dust, and body paint are just some elements of the immersive sensory experience of this work. Composer David Page, and the designers — Jacob Nash (set), Jennifer Irwin (costumes) and Nick Schlieper (lighting) — have created another world. The set recreates a towering sandstone cliff, with the lighting changing its colour and the depth of its shadows as it moves from the rose of dawn to daylight, and to night. In the depiction of their traditional lives, the women wear beautiful costumes: ruched and tucked earth-coloured dresses with string backs; skirts like woven string nets in various colours, inverted over the head to resemble woven fish traps; and pleated shimmery black and silver skirts and scarf tops in a night scene. Singing, chanting, and instrumental music are mixed with bird calls and other sounds of the natural world in the musical soundtrack. We also hear Darug, the traditional language of the Eora people, as if spoken by Patyegarang. This is a poignant connection: as pointed out in the program notes, the rediscovered record of her language in Dawes’s notebooks was a gift of cultural knowledge back to her people 200 years later. Stephen Page’s intention of honouring the Eora people is more than realised in this beautiful, absorbing and inspiring work that invokes the spirit of Patyegarang. What ultimately happened to her is unknown, but part of her story has been brought back to life. Well, I’ve missed Idina Menzel live in concert. Sometimes I have moments of common sense and self-preservation, and I remember thinking months ago, “You will have just finished The Noosa Long Weekend, moved house, seen three other shows the same week, made three deadlines, kept up with washing, shopping, meals and a marriage, AND have Poppy home for the holidays. You can’t possibly get to Idina as well!” And I was right. I saw all your tweets and pics and status updates instead and I’M HAPPY FOR YOU! I am, truly. I’m grateful to see so much as it is. What a momentous and very special event you’ve been a part of! AND some of you got to meet Idina, have her sign your Grimmerie, AND SING WITH HER! THAT’S RIGHT! OMG! We are so proud of our lovely friend Eloise Mueller, who hails from the Sunshine Coast and is well on her way to perform in all the world’s greatest venues. Well, NOW THAT SHE’S SUNG WITH IDINA AT THE OPERA HOUSE THERE’S NO STOPPING HER! And she nailed it, look! AMAZING! WERE YOU THERE? AND DID YOU ALSO SEE KRISTEN CHENOWETH? I’d love to know about your night with IDINA AND/OR KRISTEN! Let us know about your experience in the comments below. Who’s next on your Must-See List? Congrats to all nominees and winners of the 2012 Helpmann Awards! Presented by DV8 Physical Theatre and Sydney Opera House Co-produced with Théâtre de la Ville and Festival d’Automne, Paris, National Theatre of Great Britain and Dansens Hus Stockholm. Ben Mingay and Amanda Harrison. Image by Brian Geach. Thanks to Ashleigh Wilson and The Australian, here is the full list of Helpmann nominees. Now, that’s FAST! For the first time, the nominations were announced concurrently in Sydney, Melbourne and Brisbane. The List of Nominations in each of the 41 categories for the Helpmann Awards® was announced this evening in Sydney, Melbourne & Brisbane, at the Capitol Theatre, Sydney, Arts Centre, Melbourne and QPAC, Brisbane. Simon Burke hosted the Announcement Event in Sydney, Bert LaBonte hosted in Melbourne, and Bille Brown AM hosted in Brisbane. The 2012 Helpmann Awards®Ceremony, the 12th presentation of the Awards, will be held on Monday 24 September at 8pm at the Opera Theatre, Sydney Opera House. Cate Blanchett. Image by Lisa Tomasetti. Coastie [Coh-stee] noun A person who originates from the Sunshine Coast. Often mistaken for a bogan. 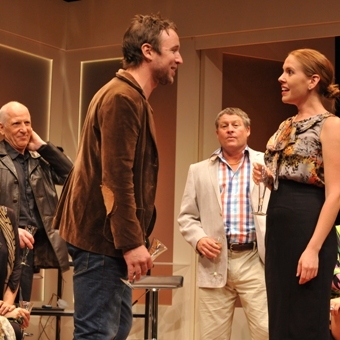 …but I couldn’t help but be a little proud as I laughed at David Williamson’s jabs at the coast. 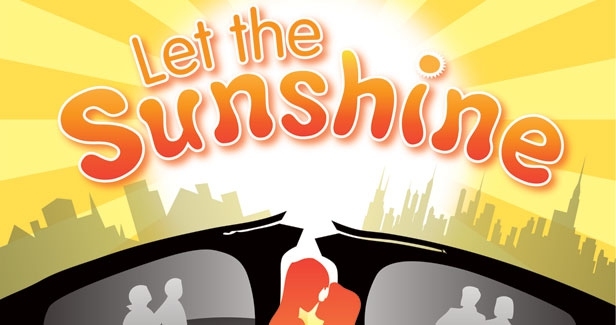 Let The Sunshine is Williamson’s hilarious, satirical play is about two polar opposite couples struggling with their children who have inevitably fallen in love. It’s been described as part Romeo & Juliet, part Meet the Parents. It had me laughing the minute the stage had lit up. Rick’s parents are a left wing pair played by Toni Scanlan and Dennis Coard. They go by Toby and Ros; Toby’s specialty being documentaries raging against the southeast Queensland coastlines being ruined by development. Emma’s parents on the other hand are Ron and Natasha. Natasha spends her days in gym pants’ getting facials and Ron is a development manager responsible for half the high rises on the Sunshine Coast. The two couples struggle to maintain a healthy state as “frenemies”. This arrangement seems permanent until Rick and Emma meet at a birthday gathering gone wrong. It’s a case of opposites attract and the rest goes like clockwork from there. The whole concept is a hilarious send-up of some stereotypes that I have to admit isn’t too far off. What stirred in me the most though were the little jabs at Sunshine Coast I couldn’t deny were absolutely true. Noosa and its six-dollar coffees as well as the Sunshine Coast’s club scene or lack there of it had the crowd snickering. But it was the hilarious comments coming out the parents’ stereotypes that have the audience roaring. The characters of Emma and Rick our star-crossed lovers as it were come off as a little flat. However I find this is no fault of the actors Ryan Hayward and Hannah Norris who do everything they can to make the characters live through the stage. The two-dimensional nature of their characters fall upon Williamson’s shoulders I feel. They are very carved out concepts. Emma, a young lawyer who thinks she wants to achieve but is more or less making the effort for her parents’ approval. Rick, the thirty something failing musician still running on the fuel of his mother and father’s encouragement. They are both truisms of Williamson’s creation. The platitudes of their psyches, flaws and feelings are nothing new I have come across. But there is hope because we are forgetting this is a satirical comedy. There just isn’t time to develop some deep meaningful pair of lovers before the punch lines hits us. I did take note though of Hannah Norris’s character arc in her role as Emma and how it changes as the play progresses. In a way, character development has been sacrificed for the greater good. The greater good in question is fantastic. It is projected across the stage and echoed back by the laughter of the audience. The banter of Natasha and Ron, played by Ally Fowler and Peter Phelps respectively, is witty and mocking of many households on the Coast. I must admit I couldn’t help but see a little bit of my own parents in them and found the whole situation even funnier. The cast as a collective reflects familiar faces. The baby boomer counterparts of the cast have all made a name for themselves through Australian television and overseas. Ryan Hayward and Hannah Norris, our example of opposites attract, have both extensively contributed to theatre down south and internationally. Having had an interview with Hannah Norris earlier, there were hints that a social message also underlies the jokes in Let The Sunshine. I had been expecting something very singular and straightforward but found flourishes of individual messages are given to the audience behind the sly face of comedy. This isn’t a show parading feminism but it does take note of women in the working environment. It can’t be called a claim for peace but there are references to the summer of love and what that dream means today. This is no meeting for the Greens going on but there are undertones of urbanization and what it means for the Queensland coastlines. You have been warned. This is a satirical comedy and in being such a concept messages are handed to us through the crack of a joke. It’s not on everyone’s mind I know but I have to say I sighed over the fluidness of the scene changes. For me I get a little shiver of satisfaction when a play runs well. It is never emphasized enough how much a production loses when you notice the stage hands or see the actors bumbling to find their next position. The smooth cog-like manner of Let The Sunshine is a credit to director Denis Moore. Each actor stepping purposely into the shadow then reappearing through another spotlight to signify a transition of scenes without so much as a hiccup between lines gives me goose bumps to watch. Under Moore’s stage direction it’s a clear a working family unit has grown during the rehearsal of this production. Let The Sunshine is a charming comedy that beguiles the audience with some hilarious actors as well as some cheeky observations. The visuals and the dialogue leave the audience chuckling in their seats. Many times even clapping mid-scene. I hope you were able to catch it during this brief Brisbane visit. If you’re in Sydney for Mother’s Day you may like to get to THIS! Be quick, it’s almost SOLD OUT! And a message for Brissie friends before next Friday’s show at the Judith Wright Centre. Are you on Queenie’s cyber mailing list? You’d better be! On that – because you are on my ‘cyber-mailing list’ you get cheepo tix to my gig…(bet Prince whatever his name is doesn’t do that…). So if you mention the word “Prince” when booking your tix – you can get tix at the concession rate instead of paying full price. Q: What do a woman masturbating in the audience while you’re singing on stage AND getting verbal diarrhoea when meeting Olivia Newton John have in common? A: THEY BOTH HAPPENED TO QUEENIE VAN DE ZANDT. Ever since she pulled on her ABBA socks at age eight, Queenie van de Zandt knew she was destined to become a performer (or hairdresser). Her mind, and face, made up, she plunged into the shady world of eisteddfods, speech and drama exams and school musicals. 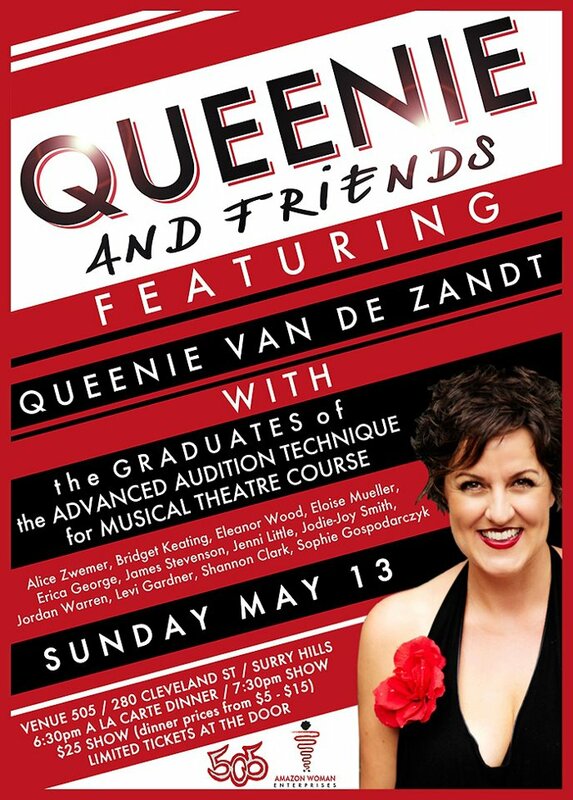 At 18, Queenie finally got her “big break” at a cabaret venue in the theatrical epicentre of… Queanbeyan. Thus began 21 years of bizarre theatrical experiences ranging from performing on the stages of Asia with some of the great actors of our time, to accidentally pooping herself in a performance of HAIR. Yes ladies and gentlemen, this right regal star of the stage has seen and done it all. 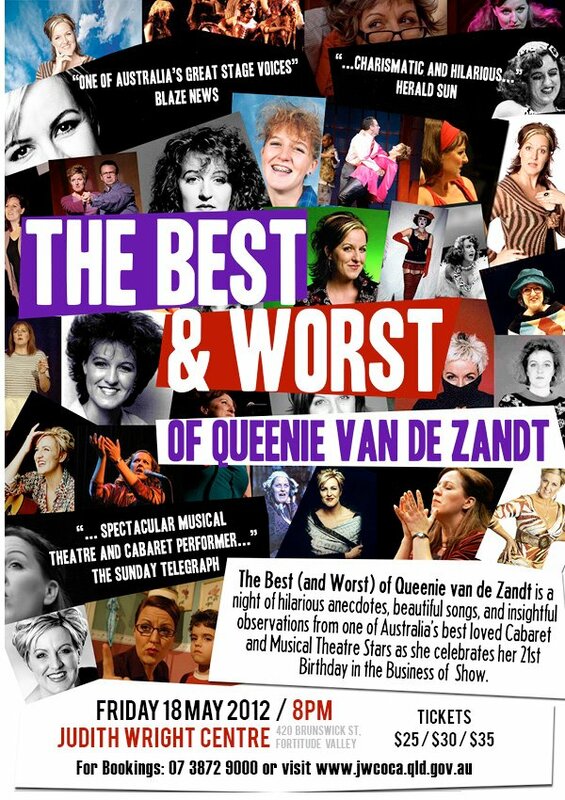 Don’t miss a night of hilarious anecdotes, insightful observations and beautiful songs from one of Australia’s best-loved cabaret and musical theatre stars!